Tuesday was a bittersweet day. I felt the hype yet I was hundreds of miles away from the excitement. Masses of protesters gathered in 25 cities all over the world and many, many more took to social media. From a distance I could tell all of the protesters brought something unique to the day’s events. One brave woman, Janet Eastham, stood outside the Department of Health in London completely naked holding a sign saying “YOU CAN’T IGNORE M.E. NOW.” The use of “M.E.” was, of course, a double entendre referring to how the government cannot ignore a naked body standing on the street, and in turn, cannot ignore the disease (M.E.) afflicting that body. Then he followed me. So naturally that made us best friends, right? I mean forget about the nearly 90,000 other people he follows on Twitter. Yeah, I know, we’re definitely BFFs. So I figured since we were such good pals he would reply right away. He didn’t. I’m still waiting. 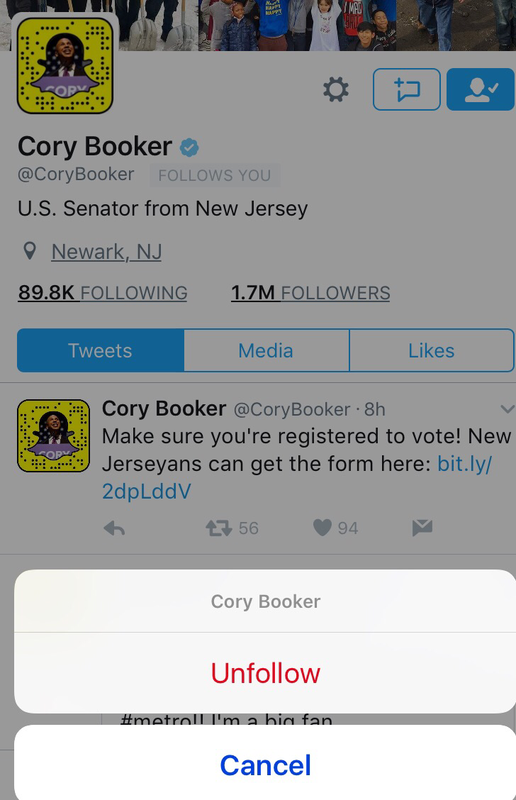 Hey Cory, I’m still waiting . . . . Eventually I moved on and sent similar messages to California Governor Jerry Brown, and Senators Barbara Boxer and Diane Feinstein, even former San Francisco Mayor and current Lt. Governor, Gavin Newsom. And guess what? None of them replied. 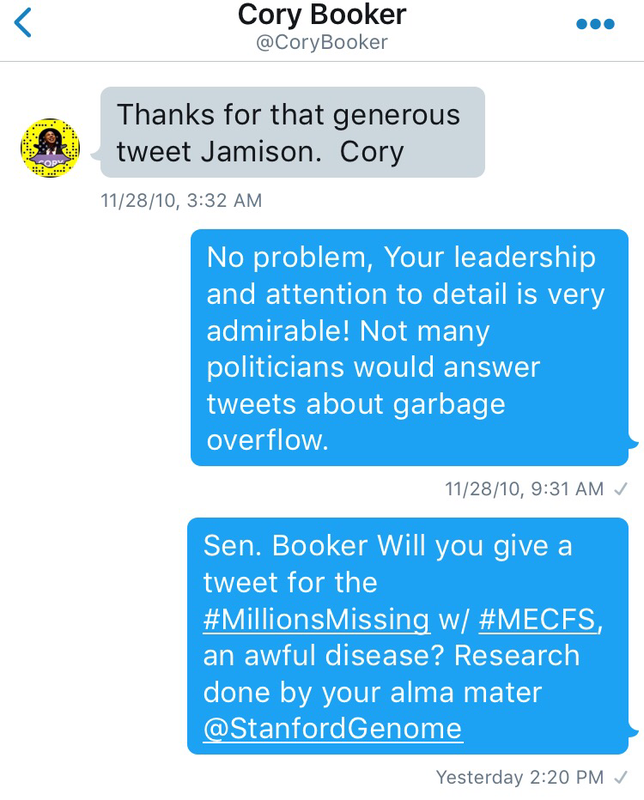 And now I’m thinking about unfollowing (breaking off my friendship) with Cory Booker #SorryCory. As disappointing as it was not to hear back from these big names in the political arena, it was encouraging to see news coverage at some of the protest sites. And to hear several luminaries from the MECFS community. As I watched short videos of the speakers I realized that each brought a different and equally valid point to the need for MECFS awareness. In a small community in Massachusetts, Erica Verrillo, whose book Chronic Fatigue Syndrome: A Treatment Guide sits on my bedside table, and a “small, but fierce” group of protesters gathered to make local government see the disease’s awful nature. Simultaneously author Hillary Johnson spoke in Washington D.C. about the history of the disease, and in her own way made it apparent that these protests need an uninformed audience. Which is how she prefaced her speech geared toward the general public, not preaching to the choir. My friends Ryan and Stephanie from the Blue Ribbon Foundation were also on-hand in D.C.
And in Chicago, Leonard Jason brought up a bevy of facts based on his research at DePaul University. He mentioned that 72% of a 900-person sample did not have access to an MECFS specialist, a point which spoke to Sonya Heller Irey’s arduous trip to San Francisco. Jason also mentioned how 90% of people with MECFS are undiagnosed and 25% are house- or bed-bound, which costs our economy 18 billion dollars a year. These sufferers are dying 18 years before the average person and the symptoms are often worse than cancer or chronic heart disease. 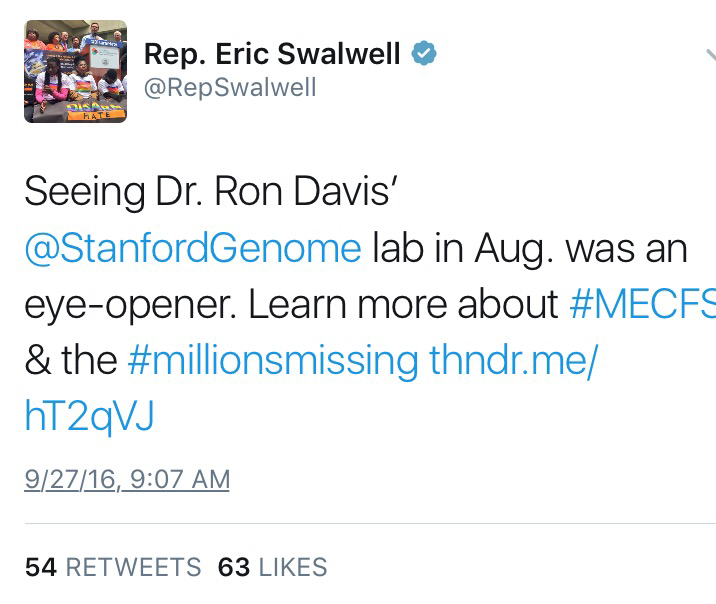 Jason suggested that one of the biggest barriers to MECFS awareness is ignorance by medical schools. According to his research only 6% of the 70 medical schools he looked at taught adequate information about the disease. As powerful as those facts were, it was the San Francisco site, a three-hour drive from my home, which held perhaps the most noteworthy speeches. Dr. Eric Gordon summed up the nature of the disease in a way few doctors can. Mainly he noted that while people with MECFS may suffer from the same symptoms it is possible, even likely the disease starts in different ways. For instance, my case started with mono and the virus that causes it and other underlying issues, while other people have no evidence of any viral infection. Then there was Janet Dafoe, whose son, Whitney is as sick as I was at my worst a year ago, unable to speak, eat, or get out of bed. She spoke powerfully about the struggle her family has endured, especially Whitney. Now that’s what I’m talking about! I must say, stuck in bed perched atop my wedge pillow staring at a grayscale phone screen that looked more like a moving x-ray than a video, Dr. Davis’ words gave me chills. I know they don’t guarantee a cure, but they do guarantee progress and that’s something the MECFS community has not seen in a long time, if ever. Please subscribe to my blog below. Thanks! Thank you for sharing your experience of ‘THE’ day. Let’s hope the momentum for awareness & support continues. It was a great day. I too participated from my tiny screen, it wore me out…but was worth it. 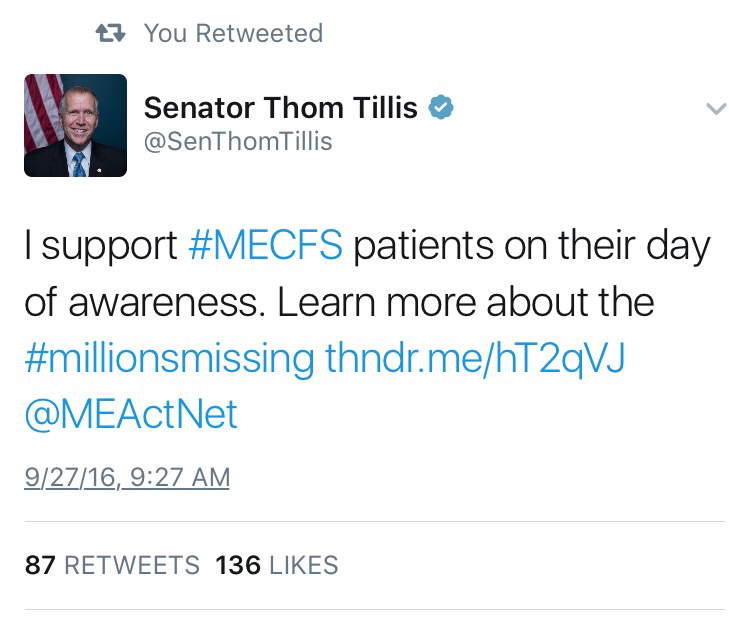 ME/cfs can’t continually be ignored! Exactly. We’re making progress. Hope more comes. Thanks for reading. I think it’s the answere to my question about my mental state right now. Don’t waste energy in fighting the thoughts of bitterness. Let them pass so there will be room for the sweet thoughts “HOPE”. Am I right? Your writing is so great – it helps me a lot! I wish my ‘English’ is that great! Hey Fabio. Haha I’m not sure but I think Siri already knows. Hi Jamison, greetings from the Philippines! It’s a treat to read your posts and how you’re able to voice your thoughts with such candor and humor. 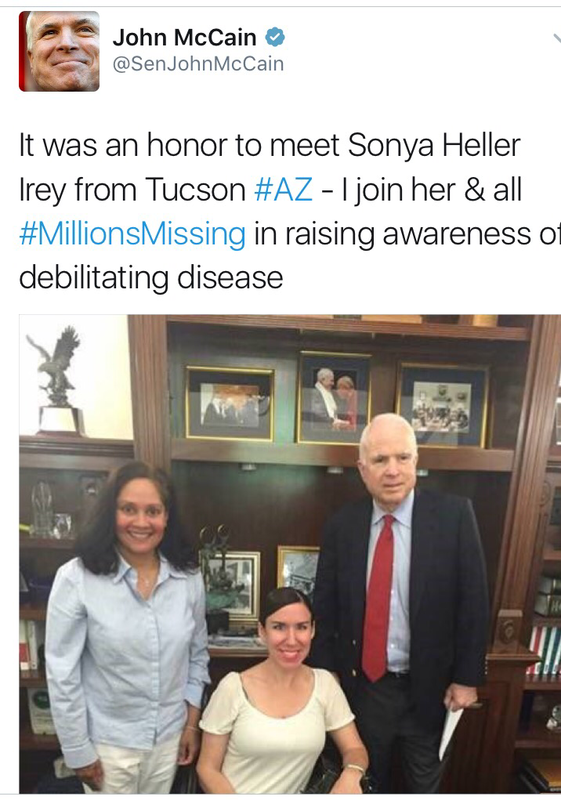 I’ve also followed the MillionsMissing protests around the globe, the responses are promising! Hope those politicians you reached out to reply to you soon! Hey. Thanks for all the great information. I love hearing how other parts of the world are handling the disease. Hopefully another senator picks up where she left off. Sounds like she was a progressive thinker. Keep in touch! Thank you so much for all you do Jamison. Everyday you keep me energized (not sure if that’s exactly the right word for me) to keep trying to do more. I have asked my Member of Parliament (I’m in Canada) to tweet about ME, which he tells me he will do this weekend. He has also agreed to sponsor our petition to Parliament for funding (thanks to friend and advocate Scot Simpson) and next Thursday we are doing a demonstration in downtown Toronto. There are only 9 off us well enough to attend but we will do our damnest. I’m designing the t-shirts posters and literature now. Never think you aren’t helping us every day. You’re the man! Thanks Jeff!